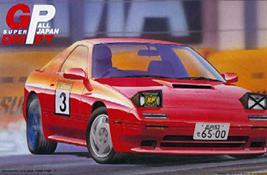 Fujimi is quite ingenious when it comes to creating new versions of their existing car kits. Fujimi does do a lot of nice sets of wheels and tires, so its only natural that they combine their kits with different sets of wheels. Apart from that, often a new set of decals and some spoilers are added and it is put in a new nicely decorated box. 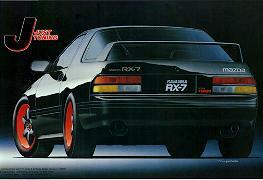 Here are some examples of the variants that were issued of the 2nd generation RX-7 kit. The 2nd gen RX-7 model, with the body and interior parts molded in red, unplated stock Turbo II wheels molded in red and an additional set of bright blue RS Watanabe wheels and a set of decals (with racing numbers, some sponsor stickers and strips of red and black 'tape') added (thanks Jaap!). This is the 2nd gen RX-7 model kit with a new rear spoiler, a set of AMG wheels from the Inch Up Disk series and new set of decals. The left upper corner of the decal set contains the same familiar items as most other Fujimi FC3S kits, but there are some neat additions like R.E. Amemiya and IHI Turbo stickers, making this kit very suited for conversion to an Amemiya Special. In fact, the instructions also show how to use the spare headlight parts to change the pop-up headlights into recessed ones similar to the ones on R.E. Amemiya's FC3S Green Machines. 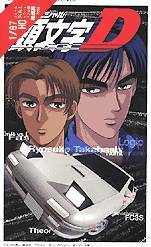 This is a revised edition of the kit listed above, it has the same box and catalog number, but the contents have changed slightly: the body is now the revised version from the Initial D kit (i.e. no engraved sunroof and different rubbing strips on the sides). This body is for an 1991 'Infinity IV' version with a single exhaust pipe on the lefthand side. The B-parts now include an optional raised rear spoiler and the clear G-parts now include an optional revised tail light cluster with circular lights. Note that only the old style front bumper is included in this kit. Body and interior parts are molded in white, chassis is molded in black, wheels are satin aluminum plated. This is an updated rerelease, with slightly revised box art and a new instruction sheet. The parts are still the same as in the previous release, including the updated 1991 'Infinity IV' body. Both early (part G9) and late (part G19) style taillight clusters are included, but only the early style front bumper (part B23). All parts for a lefthand drive version are still included but not mentioned in the instructions. The instructions do not mention the option of installing the glass hatch (part G4 and rear wiper B26) instead of the custom flat rear deck (parts B46 and G14) but the glass hatch is still included. This is basically the 2nd gen RX-7 model kit, with an additional set of front and rear spoilers, a set of 17in Lamborghini Countach-like wheels, very good looking Pirelli P-Zero tires and big Brembo brakes. These wheels and brakes were also available separately as Tire & Wheel Set nr.19117 (IU-17, Lamborghini type OZ wheel). This time, the RX-7 kit it comes with a flashy set of rims, big Brembo brakes, the same spoilers that can be found in the Super Inch Up Rx-7 kit and some funny in-car accessories such as a cool steering wheel (must be painted yellow and black) a CD changer in the back, a Travel Pilot and a mobile phone. The basic model is still the same old ID-34 kit though. This RX-7 kit comes with a set of 18in DTM rims, big Brembo brakes, and the same spoilers that can be found in the Super Inch Up Rx-7 kit. The basic model is still the same old ID-34 kit though. Note that the box art shows wheels with rather deep recessed spokes, whilst the ZEIT wheels in the kit have shallow curved spokes. Body, chassis, interior parts and spoilers are all molded in black, wheels and brake discs are satin aluminum plated. The wheels and brakes were also available separately as Tire & Wheel Set nr.19133 (IU-9, Zeit 18in wheel). This is a rerelease of the Low Profile series kit, however the body has been changed to a late style body. Both the early (part G9) and late (part G19) style rear light clusters are included and the instructions indicate to use part G9, but only the late style rear lights match the body style. Another minor change is that the Pirelli P-Zero tires have been replaced with Bridgestone RE711 tires. Body and interior parts are molded in white, chassis and spoilers are molded in black, the small sprue with the Brembo brakes and axles is molded in metallic grey and the 18in ZEIT wheels are satin aluminum plated. The wheels and brakes are also available separately as Tire & Wheel Set nr.193236 (The Wheel Series Nr.54, Zeit 18in wheel). 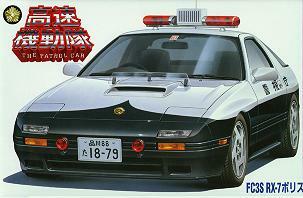 Fujimi's Police Car series is another clever and well executed idea. The kit contains the updated FC3S with additional circular tail lights cluster, modified rubbing strips but only the older style front bumper. The left hand drive dash is included but is not used. New parts in this kit are a transparent debris shield, transparent red parts for the lightbar, front signal lights and a traffic control wand, brightly plated parts for the lightbar and a set of white parts containing radio equipment, radar equipment, traffic cones, a policeman's helmet and even a pair of handcuffs and a ticket book ! Apart from the regular decal set there is a new set added with police license plates, gold colored police badges, roof top numbers, prefecture names and a decal for the curved black patch on the nose. 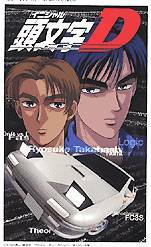 When I first saw this box art, I thought Fujimi had come full-circle by including light bulbs in the kits again, just like they did with the very first issue. But the raised and lit headlights were just added for dramatic effect, referring to the many night-time street races, as there are no electrical parts in this box. What is new in this box is a set of parts for lowered suspension consisting of two shortened front struts and an insert that should be fitted inside the rear of the floorpan, replacing the metal axle rod. The wheels are 5-spoke alloys that originate from the FD3S '99 RS kit fitted with authentic Dunlop Denloc D40 tires. The body is the updated version, with smooth rubbing strips (unlike those on the box art) and without sunroof. As usual the kit comes with lots of optional parts, including both early and late style nose pieces and tail light clusters and a raised rear spoiler. The decal set is the same as the one in the Tohge kit, so unfortunately no 'Infini IV' badge is included. 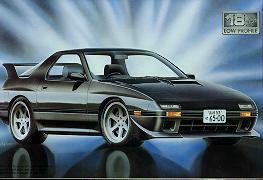 Thanks to its appearance in the popular japanese comic book and TV animation series 'Initial D' at last we got a model of the 2nd gen RX-7 Turbo in its final lightweight shape, also known as the 'Infini IV' model. The model correctly includes a new front bumper and a new tail light cluster with circular lights. 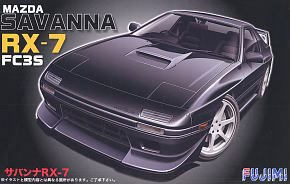 The body itself remains unchanged, although Fujimi removed the scribed sunroof and attempted to change the 'rubbing strips' along the sides of the body, but the result doesn't look quite right. A new set of wheels and the familiar load of spare parts fills this big box completely. Two sets of decals are included, a large set of generic sponsor stickers and a nice new decal set containing all decals required to depict either the 'Initial D' car or a street 'Infini IV' model. Do note that 'Infini IV' models came factory equipped with 16in. BBS wheels, not the 5-spoke alloys in this kit . 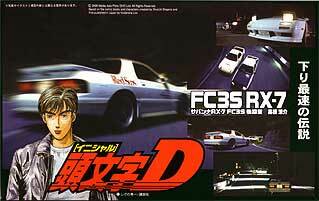 I found this kit listed on a japanese site dedicated to 'Initial D', it is a special release for the japanese anime 'Initial D, the Revenge' and contains a 1/87 FC3S RX-7 miniature, cast in pewter. 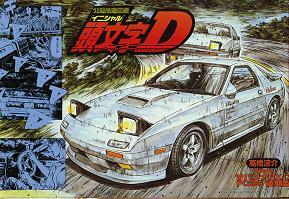 This kit contains the same parts as the first 'Initial D' version, apart from an extra set of decals with new style logos for 'Red Suns' and the other 'Initial D' teams. 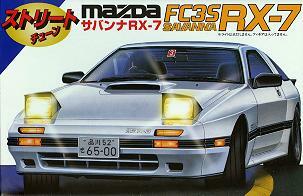 The box contains a nice gift: a cast metal key ring with an embossed image of Ryousuke Takahashi in front of his RX-7 FC. The rereleased kit also contains a sprue of parts with a new front bumper/spoiler, a manual shift knob, an interior part with storage bins instead of rear seats and streamline covers for the door mirrors. This is a limited issue with two 1/24 scale resin figures of the Takahashi brothers included. Apart from the figures, this kit also contains a sprue of parts that I hadn't seen in Fujimi's other FC3S kits before: a new front bumper/spoiler, a manual shift knob, an interior part with storage bins instead of rear seats and streamline covers for the door mirrors. Of course the familiar load of spare parts is also included. The figures capture the looks of the Takahashi brothers in the animation series well, making this kit great value for money. 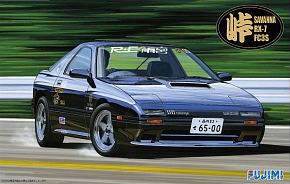 This kit represents the RX-7 FC as it is featured in the new 'Initial D' live action movie and DVD series. The box art shows some movie stills and there are some pictures and info on the DVDs on the side of the box lid. 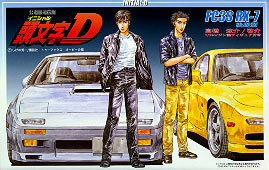 Parts and the two sets of decals are identical to those in the most recent release of the regular Initial D RX-7 FC. Body, wheels and interior parts are molded in white, chassis parts and some additional parts are molded in black. This is a resin set made by japanese resin craftsman Gesse. The set contains unpainted resin parts for FC3S driver Ryousuke Takahashi and a number of upgrade parts for the Fujimi 1/24 FC3S kit: front spoiler, rear wing and steering wheel.